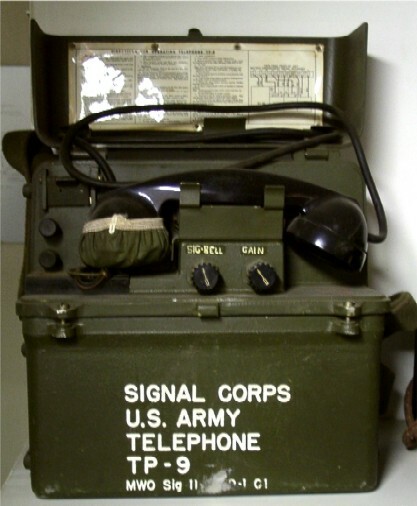 Field telephone; weight 9.5 lbs; local battery; leather or canvas carrying case, ringer; hand generator, ringing range 3000-ohm line with leakage resistance of 1000 ohms, 2000 ohms on lines equipped with two repeating coils C-161; holding bridge provides signalling to common battery switchboards; antisidetone circuit; handset TS-9-( ); transmitter current supplied by two batteries BA-30 on connection to either magneto or common battery boards. Wall mounted telephone box; common battery; ringer; hand generator for signalling magneto lines; antisidetone circuit; Handset TS-12-( ) used with but not part of EE-91; transmitter current obtained from central office battery. Telephone box EE-91 mounted in wooden box for outdoor use. Telephone box EE-91 mounted in metal box for outdoor use. Field telephone; weight 8 lbs; leather or canvas carrying case; sound powered handset TS-10-( ); ringer; generator for signalling magneto switchboards. Used where conditions make batteryless operation necessary. Combined hand telephone set; weight 6 lbs; common battery; ringer; dial (optional); antisidetone circuit. Switchboard, single position, 4 lines. 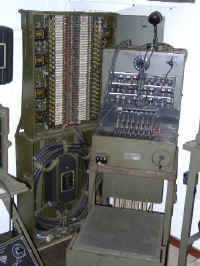 Field or camp monocord switchboard with fibre carrying case. Telephone EE-8, ordered separately, is used for operator set, and for ringing on lines. Trunks to other switchboards must be of ringdown type. Night alarm bells or Buzzer operating on two Batteries BA-23, mounted externally and ordered separately. Two switchboards BD-9 can be used together to double capacity. Switchboard, single position, 12 lines. Same as switchboard BD-9 in general design and features except more lines provided. Switchboard, single position, 40 lines. Field or camp magneto switchboard, portable, self enclosing trunk style, not requiring packing case. Total weight about 185 pounds, packed. Telescopic legs. Can be used for temporary or semi-permanent installation. Cord circuits are ring-thru type with one ring-off or rering drop; rings or both cords. Trunk to other switchboards must be of ringdown type. Switchboard, single position, 6 lines. 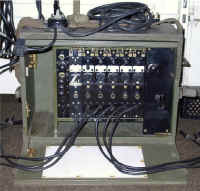 Field or camp monocord switchboard, cabinet style, self-enclosing, with handles and carrying strap; not requiring packing case. Telescopic legs. Total weight about 48 pounds, packed. Equipment is accessible from front, top and rear of cabinet. Line drop acts as ring-off or rering drop. A lamp on each side of switchboard furnishes illumination for night operation. Lower half of front acts as writing shelf and has a sheet of white pyrolin erasable writing surface for diagrams or other data. 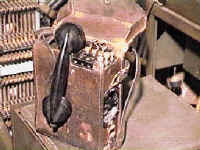 Trunks to other switchboards must be of the ringdown type. Simplex coils provided on two line units for telegraph or phantom use. Two switchboards BD-71 can be used together to double capacity. Spark gaps provided on lines. Includes hand generator for ringing. 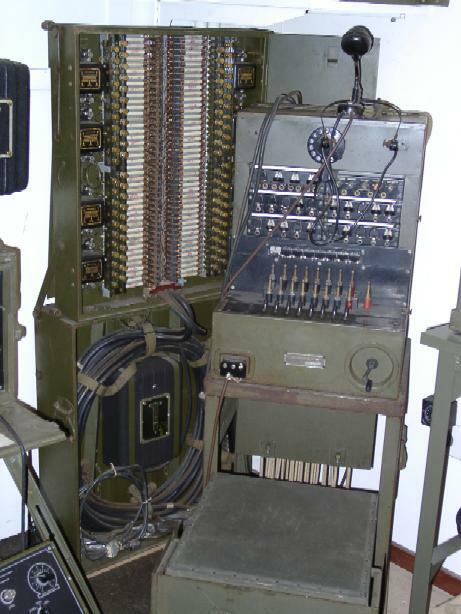 Same as switchboard BD-71 in general design and features except more lines are provided and simplex coils are provided in four line units for telegraph or phantom use. Total weight about 72 pounds, packed. 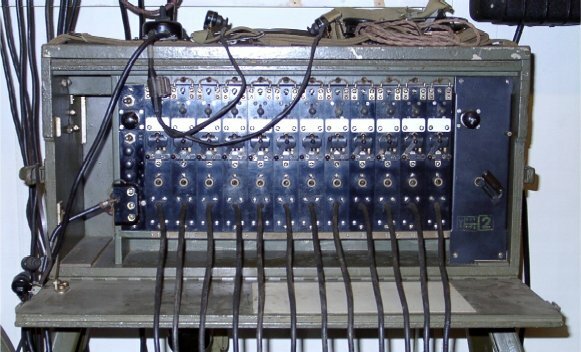 Switchboard, multiple position, 30 lines per position. Army or other headquarter complete transportable multiple type magneto and common battery central office. Switchboard, single position, 20 lines per position. Army corps, or other headquarters complete transportable single position magneto and common battery central office set shipped in trunk type carrying cases. Main component is Switchboard BD-89 which is a two-panel nonmultiple position. Switchboard, single position, 40 lines per position. 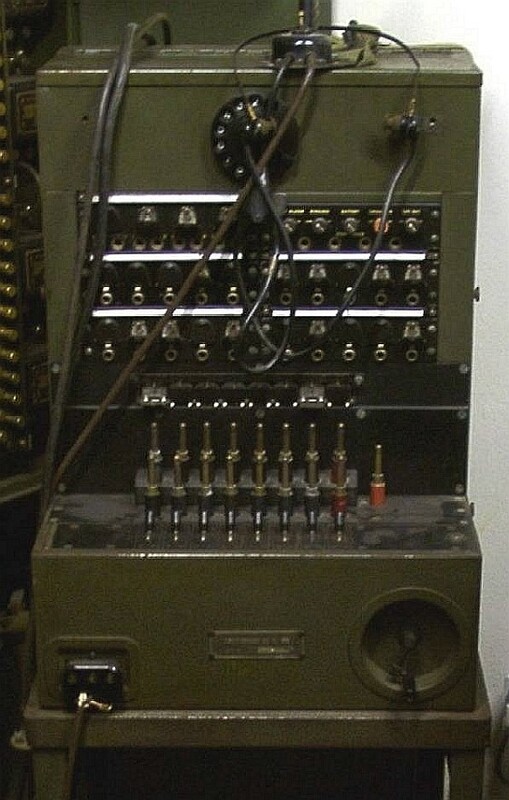 Division or other headquarter non-multiple magneto central office of which switchboard BD-96 is the main component and which is a portable single position. Consists of the additional equipment necessary to make two Telephone Central Office Sets from a single Telephone Central Office sets TC-1 or TC-10, or three sets from two. Particularly useful in moving a central office set from one location to another, placing one or two positions in service at the new location while keeping the remainder working at the old location. Army or other headquarter complete transportable multiple type magneto and common battery central office set in which the three switchboards BD-110 differ from the switchboards BD-80 in being trunk type with handles and which requires no packing case. Army Air Force squadron or other headquarters nonmultiple magneto central office, of which switchboard BD-91 is the main component. 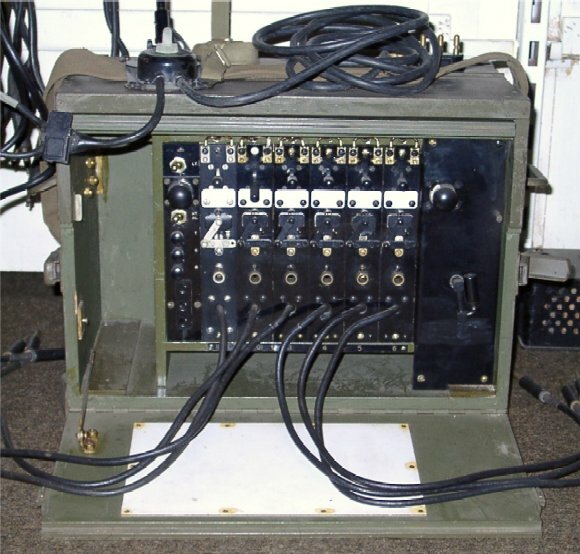 Army or other headquarter complete transportable multiple type magneto and common battery central office set in which the three switchboards BD-120 like switchboard BD-110, are trunk type with handles which require no packing cases. Fixed plant wire chief's voltmeter testing equipment and telephone set, to maintain common battery and magneto office equipment, station lines, and trunks. Trunks can be maintained more conveniently with TS-26/TSM, 20 cycle hand generator or central office ringing machine, and buzzer. Has posts for adding a Wheatstone bridge for locating faults. 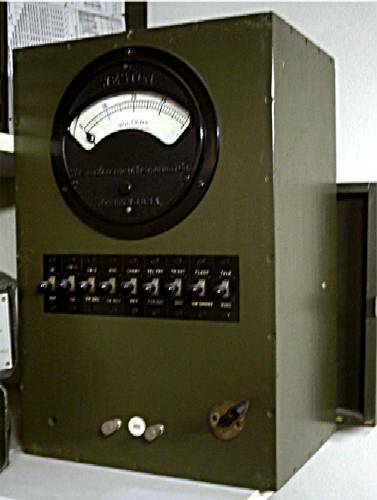 Part of test equipment IE-10. Also part of telephone Central Office Sets TC-1 and TC-2. Tests for grounds, crosses, shorts, and opens, line capacitance to ground or to other lines, and distance on an open line.